MIDD Volleyball 2017-18: Alum Jane Handel's ('12) 8th Graders Take Championship! Alum Jane Handel's ('12) 8th Graders Take Championship! Jane Handel ('12) is coaching an 8th grade team in the Chicago area, and her team just won their Championship!! 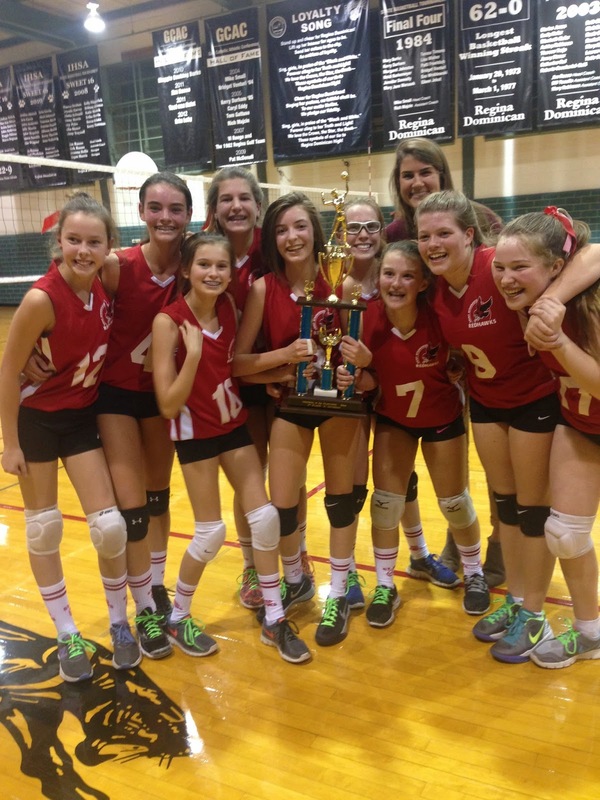 The St. Athanasius Redhawks beat St. Fancis 25-12, 25-12 for the Championship. Well done, girls (and Jane!) How exciting. The look of pure joy and FUN is all over these young faces. This is where it all starts...any future MCVB'ers in there?! We have a few alums now in the coaching ranks, which is exciting. Meg Anderson ('14) is our assistant here at MIDD, Luz Brito Pena ('04) is coaching at her High School in NY, Elissa Goeke ('12) is coaching with her former HS team in MD, and Megan "MJ" Jarchow ('14) assisted Concordia College in NY this past year. I'm sure I'm missing some, as I know that Courtney Shepard ('14) has done a lot of club coaching, Lacee Patterson Phillips ('08) has been involved with the Starlings Club Program, Katy Hicks ('05) had a stint coaching before becoming a Doctor, and I'm sure there are a lot of others out there as well, maybe Lindsay Patterson('08), and Lexie Fisher ('08), or Rachael Faraone ('02), or Kellie Jensen ('02)?!? Caitlin Barrett ('13), Lauren Barrett ('11), and Sarah Studwell ('13) have all sat on the bench here for games as "assistant coaches" as alums, so that counts too. :) If I've left anyone out, please let me know! Happy Thanksgiving all, and thank you, Jane for sharing your fun news! !